1) Were M4A2s actually used in the ETO--at Normandy--or elsewhere on the "Western Front"? The British Army converted 293 M4A2's (Sherman III) to the Duplex-Drive variant for D-Day landing. Frenchy, Thanks-- yes I knew the French and Russians used them, I'm trying to determine if they were used by US Forces in the ETO-- I don't think they were, being primarily used for export service, or for the US Marine Corps, which had over 200 on hand I believe. But I'm also trying to find out where UM Models got the info for their kit No.214, which is an M4A2 used by the US 746th Separate Armored BN on D-Day. I think they have the Tank type (M4A2) incorrect. This could be because the Marines used the M4A2 in amphibious operations, UM may just be assuming the M4A2 is an "amphibious" tank. I'm also looking for photos of dozer tanks on the M15 trailer, but haven't found any. Ordnance accepted 8053 75mm M4A2s. 7413 went to overseas aid, including 2eme DB. So that leaves 640 retained in US service. USMC took A2s because they were available immediately, not for any Navy fuel compatibility or other reason. They also had A1 and A3. One reason the UK chose the A2 largely for DDs and exclusively for the BARV was the lack of engine electrics likely to be affected by water ingress. So it is not beyond the bounds of possibility that A2 dozers might have been deployed for beach work on D Day, where they might have been required to work in water. Not that this proves anything, but it has logic. However, 746th were not in the intial assault wave and didn't start coming ashore until about midday. So that's the logic shot down. However, assuming the Bison serial number is correct then it belongs to a PSC-built M4 and not to an M4A2. So it looks like UM goofed. Here she is in the flesh. Peter, thanks for the info. Actually, “Bison” is not depicted in the UM kit, it’s a different tank with a wide white band going completely around the turret, through the star on the turret side. It doesn’t look like any of the tank profiles on the decal sheet Frenchy provided in his post. I suppose it could have been one of the D-Day “Funnies”, as you said, because of its Diesel engine which would have had fewer electrical components—that makes sense. But I have to agree, I think UM has screwed up. I’m considering taking the M1 dozer blade, and tracks and some of the PE from the UM kit and using them on a 1/72 Dragon M4A3 76 (W) I have from operation Cobra. I've checked my considerable number of reference books about US ARMY M4-series Mediums and the 6 June, 1944 D-Day landings, the operative words being "US ARMY M4 Mediums"... I found nothing to claim or even suggest that US ARMY M4A2s came ashore on Omaha or Utah Beaches during the landings or in the months afterwards. Thanks Dennis, kinda what I'm thinking too. I wonder what the major differences are between the M4 and M4A2 would be in 1/72 scale-- engine grill, rear deck and exhausts are the only thing I can think of right now. There are some extra parts in the UM kit, and the kit is designed to be sort of "modular" in the driver's hatches, glacis plate, transmission cover, and rear deck area-- I suspect it's the same general body for all their kits. It might not be too hard to convert it into an M4. But the real question then is if the Dragon Wagon would have been able to accommodate a Sherman with a dozer blade-- and if not, how were they transported? The DW could easily accommodate the M4 and dozer blade, but they had no problems getting around on their own, just like their no blade cousins. The Shermans issued to US units participating in the Normandy landings were all M4 and M4A1 tanks equipped with Wright Continental R-975 radial engines. This had been policy for all US Army units overseas until 1944, when the Army concluded that the Ford GAA engine in the M4A3 was more reliable, and that became the new, preferred version. That said, with vast numbers of 1943-vintage dry stowage M4 and M4A1 tanks prepositioned for the invasion, the combat debut of the wet stowage M4A3 was delayed until after the Normandy breakout, to simplify the supply situation. 200 new, wet stowage M4A1 Shermans with 76mm guns were also deployed, being split between the 2nd and 3rd Armored Divisions. The US Army used dry stowage M4A2, M4A3, and M4A4 tanks in the continental United States solely for training. When the training program wound down, they were returned for factory rebuilding. 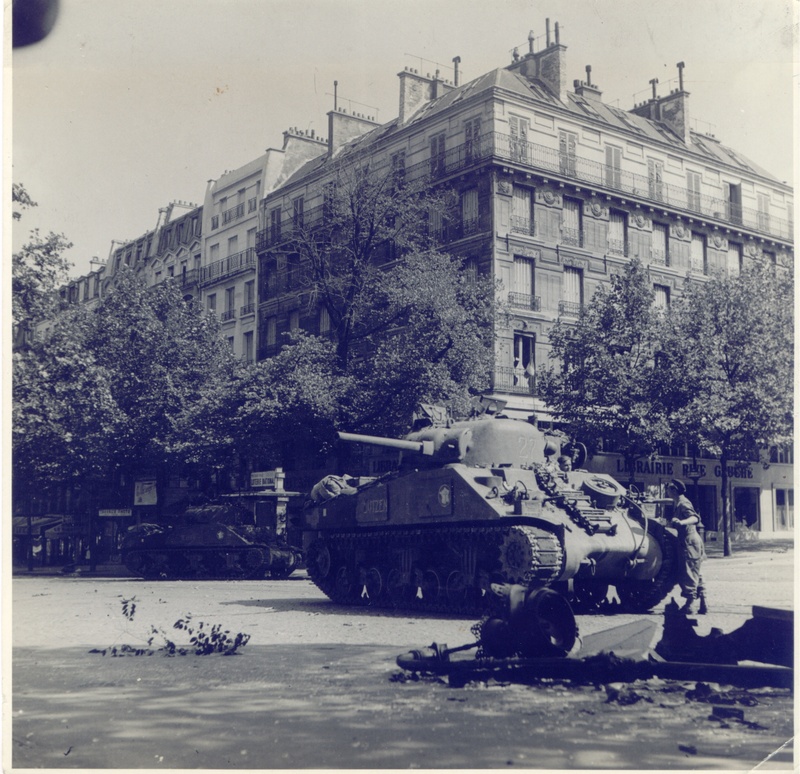 The refurbished M4A2 and M4A4 tanks went to the UK in 1944, and some of the rebuilt dry stowage M4A3 tanks went to US Army units overseas in 1945, appearing in Western Europe and on Okinawa. The US Marines used the M4A2 in the Pacific, until the supply of 75mm dry stowage M4A2's dried up (Fisher had stopped making them early in 1944), and most Marine battalions had switched over to the M4A3 by war's end. During the North Africa campaign, there was a shortage of replacement M4 and M4A1 tanks, and a few M4A2 tanks were issued to the US 1st Armored Division from UK stocks. There is anecdotal evidence that they were never turned in, serving later in Italy alongside the more numerous M4. However, there are no photos to confirm this. In August, 1944, a British M4A4 with a bulldozer blade was transferred to a US engineer unit in Italy, who converted it to a mine plow. It was used in the Operation Dragoon landings on the French Riviera. Thanks for the information. All the different variations, permutations and instances sure make my head hurt! It just goes to show there are always exceptions to the rule in wartime. I'm even more convinced now that UM got the unit and vehicle type wrong in their marking profile and kit designation. Another thing I notice about the M4A2 is an absence of photos of the exhaust system at the rear of the tank on the Internet-- anyone have some good ones? I don't recall, now. The relevant article is buried somewhere in my storage unit (I had no plans to build one). Roy Chow researched it and published the wartime photo, along with his 1/35th scale rendition of it a number of years ago. The improvised mine plow added to the dozer blade is very distinctive. Thanks Gerald-- I'm finding the UM kit is close, but little off on the rear deck and exhaust systems from the photos. I think what they've done is made their Shermans with interchangeable parts-- so as to use the same hull for all their Shermans. They do have nice features though, including nice link & length tracks, nice suspension systems, and photo-etch for headlights and return skids on the HVSS systems. So I think Ill be doing some "kitbashing" . I think Peter's reference to "Bison" was not to the name of the vehicle,but to the decal sheet. Star decals were formerly Bison Decals, not that the vehicle name is Bison. Rick, thanks for that. I misunderstood. However, UM doesn't include any serial number in the kit, so there's no telling what tank it is supposed to represent. I think they just picked a tank at random, and called it an M4A2, probably because that's what they had on hand in the Ukraine (UM Models is Ukrainian)-- likely left over from The Russian stock of M4A2s. The Brits used Sherman III with the assault divisions on D-Day. 27th Armoured Brigade, 8th Armoured Brigade and 2nd Canadian Armoured Brigade were equipped with Sherman III. These units were the only Sherman III equipped British Armoured Forces in NWE. In Italy the the 20th NZ Armoured Brigade had Sherman III. If I remember it correctly 4th Armoured Brigade had Sherman III in Italy. 4th AB was relocated to GB end of 1943. Maybe 20th NZ Armoured Brigade got their mounts. In NWE 4th Armoured Brigade was equipped with Sherman II. Hauke, thanks for the info. Unfortunately, I'm looking for any information on US units in The ETO that may have used the M4A2, but it doesn't look like any did-- so I'm convinced UM has made a mistake in its kit. I'm going to use the link and length tracks, dozer blade and some of the detail parts from the UM kit on a Dragon M4A1 76(W), and call it good. Now I need to find photos of an M4A1 fitted with a dozer blade-- there's one in the manual, but that's all I've found so far. Now I need to find photos of an M4A1 fitted with a dozer blade-- there's one in the manual, but that's all I've found so far. Google is your friend for that! Plenty of early "small hatch" M4A1s with blades on the web. The dozer blade came as a kit designed to fit any M4 VVSS model, so were seen on M4A1, M4, M4A2, and M4A3 hulls. Tom, Thanks, Yep-- I've looked in several places, and in several books, but the only photo of an M4A1 76(W) I've found so far on the 'web is a BW photo from the M1 manual. I'd like an Operation Cobra photo if possible, because I've heard some M4A1 76(W) tanks were hauled from Normandy to their jumping off points by M25/M15 Dragon Wagons, something I want to depict. Sorry - I missed the "76W" part! That's a different kettle of fish entirely. There weren't many of those brand-new "war winning" big-hatch M4A1 76Ws at all at the time, so I seriously doubt any in Normandy (where they were first deployed in haste) would have been fitted as dozers - they were just too valuable as free-wheeling gun tanks. There is a photo of a big-hatch hull with dozer (but no turret) near the end of the war, but I cannot recall any as early as Normandy. Tom has raised a very good point for me-- I'm not sure any proof of the Operation Cobra M4A1 76(W)s exists they would have been fitted with the dozer blade, since they were designated as "breakthrough" tanks for the operation (and except for the M1 manual, I can't find any photos of an M4A1 76(W) fitted with a blade). Therefore, I took a look at the UM M4A2 kit again, and have discovered it comes with parts for an early M4A3 (the kit is loaded with all kinds of extra parts). 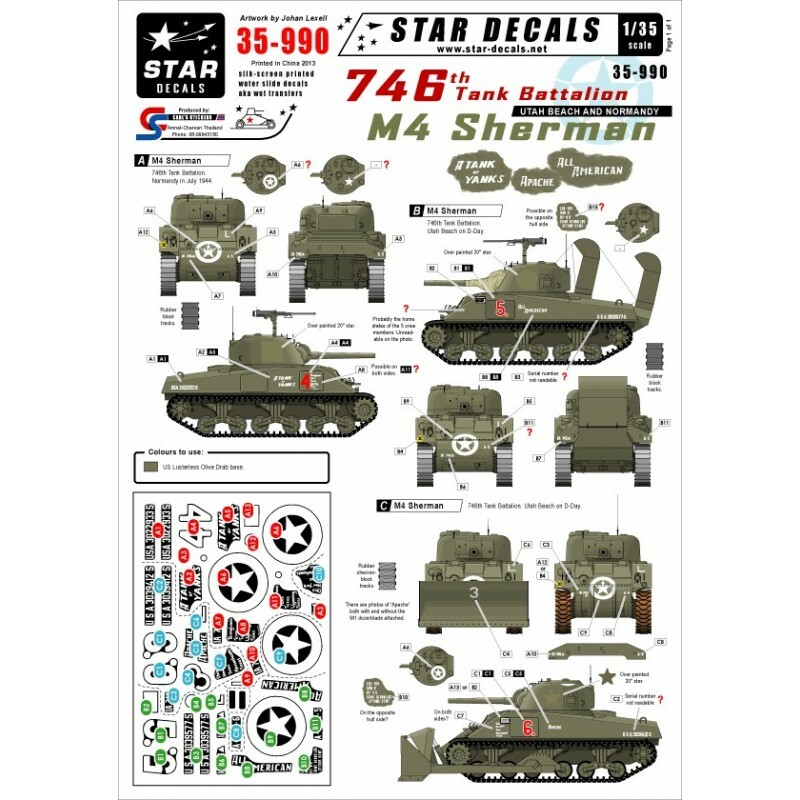 Since the M4A3 was the most numerous Sherman model, there must have been more than a few M4A3 blade tanks-- so I think I'll proceed with a small conversion in that direction. Thanks everyone for your input. I don't think there were many (or any at all) M4A3 gun tanks in Normandy. 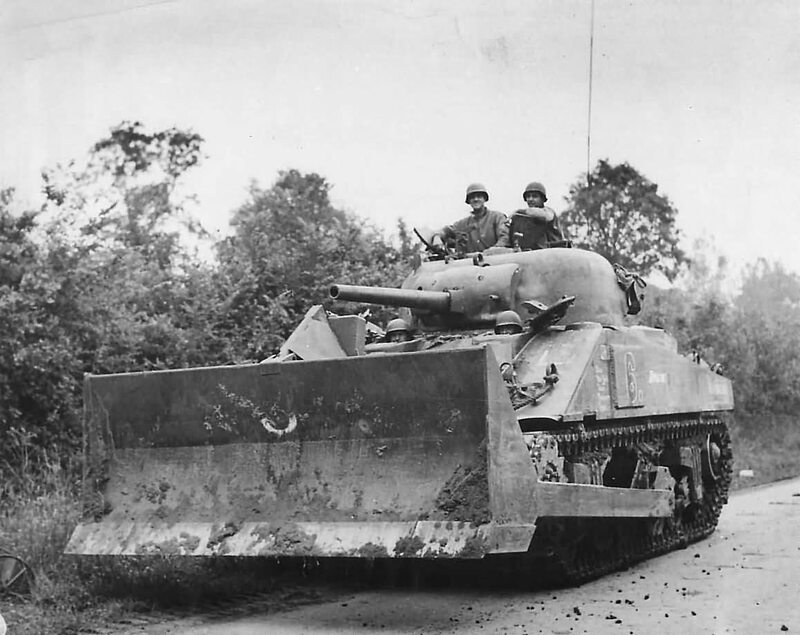 The Large hatch M4A3s were produced too late to reach the front lines by that time. The small hatch M4A3s were used for Stateside training until a number were sent to the ETO as replacement tanks after the Bulge.